After becoming friends online, Adam and Daniel met two months later on the platform of Truro railway station, amid the frantic scurry of commuters. Six months later, in the same spot (but in pouring rain!) Adam popped the question. Once their engagement had sunk in, they began planning – firstly with a trip to a local wedding show, where they met Laura Coleman, wedding coordinator at Holne Park House. A visit to the venue for tea, cake and a guided tour made their vision come alive. ‘When we drove down the tree lined road, the house appeared and was so stunningly beautiful that I knew instantly that this was going to be our wedding venue,’ says Daniel. The couple decorated the ceremony room with crystals, floral bunting and chair covers. 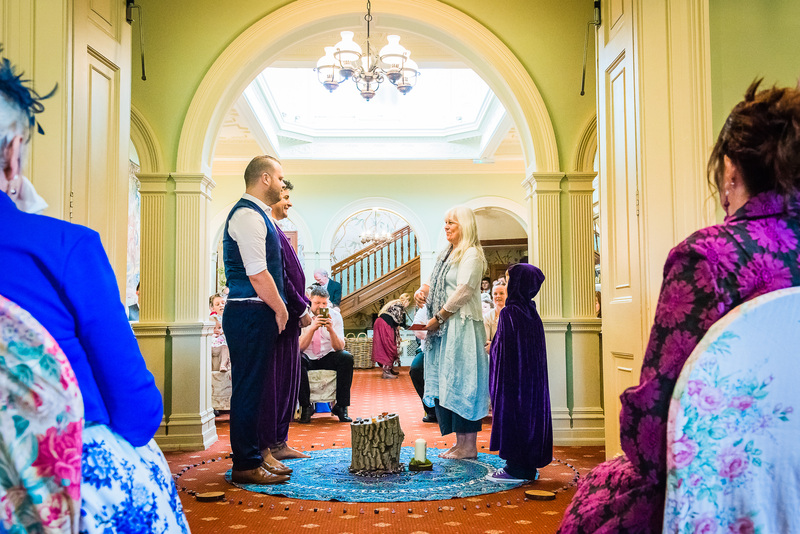 Their centre circle was created using stunning amethyst and sodalite crystals – the purple and blue representing the colour theme of their wedding. They chose to have a wishing tree instead of flowers, with guests pinning their well-wishes and votive offerings. Before the ceremony took place, the atmosphere was set with a mixture of Celtic music from Enya, the Corrs and Clannad. The rhythmic beat of Bodhran drums played as the couple walked down the aisle, with Daniel holding the hand of their six-year-old son Rheuben, who had the very important role of best man. Daniel wore a purple velvet jacket with a white shirt underneath and purple harem pants with leather flip flops. Adam wore traditional attire, including navy blue trousers, a waistcoat, white shirt and brown leather brogues. They were followed down the aisle by flower girls in floral dresses and pageboys in navy blue trousers and waistcoats. 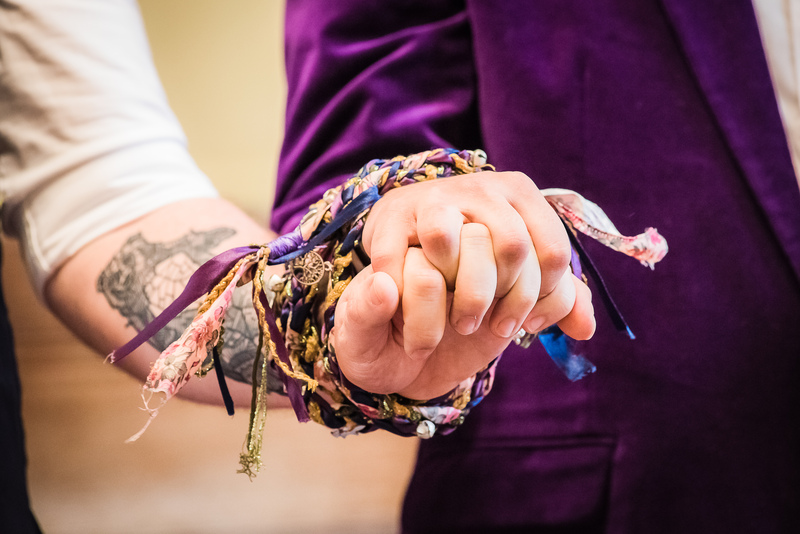 An important part of the ceremony was a Pagan handfasting, complete with binding cords, vows and ‘jumping the broom’ – an old marriage tradition that symbolises entering a new stage of a relationship, as well as sweeping out old energies and clearing away negativity. The beautiful and rolling grounds surrounding Holne Park House provided the perfect backdrop for their special and intimate day and the couple explored several romantic spots to take photographs and create everlasting memories. ‘Due to the number of spiritual people at our wedding, many of them embraced the chance to meditate within the grounds and commune with Mother Earth and the trees,’ says Daniel. Guests enjoyed afternoon tea for the wedding breakfast, which included beautiful handmade cakes and pastries, followed by a gorgeous three-tiered wedding cake. The wedding cake was a traditional white iced sponge, a chocolate cake and a delicious carrot cake decorated with stunning pieces of Labradorite around the edges and topped with a crystal mandala alongside a Labradorite bear and tiger – each representing the happy couple. Then onto the dancefloor, where local DJ, AllStars Entertainment, gave plenty of opportunity to justify another piece of cake. At the end of the night, the guests had just a few steps to retire to their luxury rooms, and the couple to their amazing suite.